When it comes to pruning trees there can be several different theories and practices out in the real world. The purpose of this article is cover one small aspect of tree pruning, the pruning of limbs and branches. When we understand these three terms, we will be able to make a proper pruning cut. The identification of the Branch Bark Collar is the most critical aspect of our pruning cuts. Where the branch meets the limb or trunk there is a swollen area at the base of the branch. In the photograph above, you will see, the branch bark ridge (arrow), the place to make the correct cut (marked by the dark line), and the branch bark collar between the two. The pruning cut made, as indicated by the dark line, will be a healthy cut. In the photographs to the left you can see the results of improper pruning cuts. The cuts on these two trees show evidence of decay, the inability of the tree to form wound wood and the onset of cankers. These cuts may cause the death of the tree. 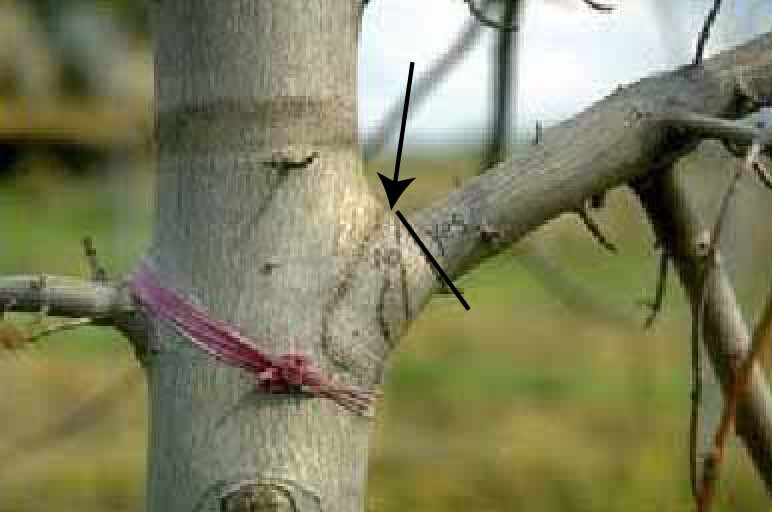 When a cut is made flush to the trunk or branch, the wound eliminates the trees’ natural ability to seal over the wound. In the branch bark collar there is a natural branch defense zone. 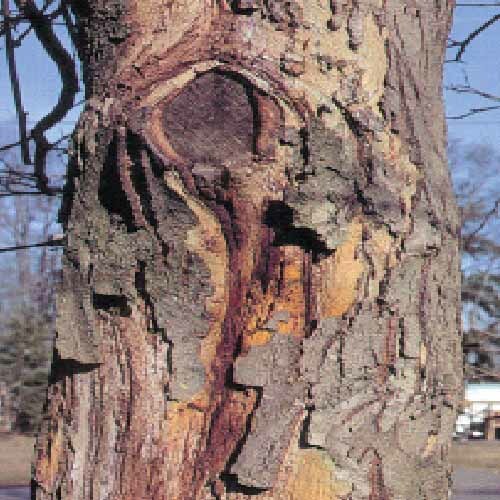 This zone protects the tree from the wound by initiating chemical changes that protects the trunk from decay. To cut through the branch bark collar disrupts the trees’ defense zone opening it to what you see in the photographs above. The above article is just the tip of the iceberg when it comes to the proper care of trees. For further information on any horticultural practices I will refer you to universities throughout our country and their researched based information. Photograps in this article were provided courtesy of Washington State University Extension. After completing the Colorado Master Gardener program in the winter of 2010 at the Colorado State University Extension office in Gunnison, I enrolled in the Virginia Master Gardener program, held in Newport News, the following fall. This repeat experience provided an opportunity to observe the best elements of both programs and perhaps offer suggestions for improving the learning experience for future students. Both programs offered the same basic knowledge essential for becoming a Master Gardener volunteer. But each gave greater emphasis to some subject areas than others. Of course, some of the differences stem from the vastly different environmental conditions of the two states. The dry, thin, cold air of the Upper Gunnison Valley gives rise to conditions that are a world away from the mild and often steamy humidity of the Chesapeake Bay. And the vast array of plants that thrive at sea level in Zone 7 seemed almost overwhelming to someone who was initially schooled in the narrow range of species that can survive the month or so of frost-free days at 9,000 feet in Crested Butte! The most striking difference between the two programs lay in the way the lessons were organized. Gunnison condensed a week’s material into a single day, broken by a lunch hour. This schedule had its advantages, perhaps making it easier for working people to fit the program into their work schedules. But it made for a pretty exhausting day, incorporating a lot of material into a single session. The Virginia program split sessions into two mornings a week. Most of the students lived close to the classroom, and a good number were retirees with less demanding schedules than Gunnison’s mostly younger, employed students. The downside of this arrangement was that a few students had two days a week of driving to cope with, for me two hours each way. All things considered, I preferred Colorado’s schedule. Another difference lay in the way the classes were taught. Colorado’s vast spaces made distance learning essential, while the location of the Virginia program, close to the cities of Norfolk and Newport News, made it possible to have live teachers present at each class. Many of these, as in Colorado, were current college professors, but a few were retired professionals and landscape designers. Having instructors in the classroom made it easier to ask questions and have lively exchanges between students and teachers – and eliminated the inevitable computer glitches that occasionally interrupted the learning experience in Colorado. There were a lot more students in our class in Virginia – about 60 from several communities in the Tidewater region. That made for a lot of questions and a more lively but chaotic classroom than our small class of about 12 in Gunnison. Of course, there were many more students taking the course in Colorado, but the electronic teaching method necessarily limited communication among the participating extension offices. Because of the location and the season, we had six to eight field trips in Virginia, which broke up classroom time and enabled students to get some first-hand experience that was necessarily lacking in Colorado’s winter session. We visited several nurseries and heard much advice from growers about species and growing conditions in Tidewater Virginia. One valuable visit with an instructor to a park in Williamsburg enabled students to practice pruning techniques on shrubs and small trees. While the subject matter was similar, the two programs placed special emphasis on different subject areas. Memorable from the Colorado program were the emphasis on methods for diagnosing plant pests and diseases, a fascinating class in Salida on entomology that gave me a whole new fondness for bugs and Jon’s helpful support in finding ways to satisfy our volunteer hours. I won’t begin the volunteer phase in Virginia until this spring, so I can’t yet compare the two experiences, but I did notice in class a greater emphasis placed on sustainable gardening – composting (no bears), organic cultivation techniques, raising worms, and of course preference for native plants and lawn reduction. The importance of water conservation received much attention in both programs, though for slightly different reasons. Careful use of water through correct irrigation techniques and plant selection was emphasized in Colorado, reflecting the problem of drought in much of the state, while water conservation is essential in the Tidewater region because the adjacent Chesapeake Bay is badly polluted by stormwater and agricultural runoff. An entire class on the principles of landscape design was much appreciated by the Virginia students. Finally, the Virginia program ended with a real graduation ceremony, complete with lunch, door prizes and certificates, paid for by the students. It was hardly necessary, but a fun way to end the program. It’s December and it may look to you as though I am just sitting in front of the fire, doing nothing in particular, eating fondue, and waiting for the snow to melt so I can get gardening. Au contraire, Gruyere breath! I am working hard on one of my most important gardening projects of the year. I’m composting. In essence, for the average person composting is the process of turning garbage into valuable gardening and landscaping materials. This process is performed by literally billions of bacteria, fungi, and microbes doing what has been their natural function since the inception of life on planet Earth: eating and breeding. These organisms require little to accomplish this: just air, moisture, heat, and food. 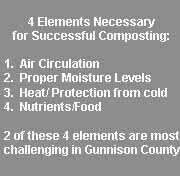 The Challenge In the Gunnison Country: Compost is a valuable organic soil amendment with very few drawbacks. However, like many things, composting in Gunnison County presents a number of challenges not often encountered when compared to composting at lower altitudes and in warmer climates. Knowledge of a few simple tips and techniques will assist the Gunnison area gardener/landscaper in successful composting. Air: While it is true that the air in Gunnison County is quite a bit thinner than the air at lower elevations, there is ample air for composting. The real problem (not unique to Gunnison) is to get the air to the compost organisms. This is accomplished in two ways: constructing the compost pile to enhance air circulation and periodically turning (stirring) the pile to expose different portions to the air. A compost pile without air is dead, because all the little beneficial organisms suffocate. Moisture: Much of Gunnison County is very arid, some areas even qualifying as alpine deserts. Compared to other places, Gunnison composters need to be more mindful of maintaining sufficient moisture levels in their compost piles. In other locales, rainfall and high humidity provide sufficient moisture for the composting organisms to thrive. In Gunnison Country, however, some additional moisture must be supplied to compost piles. In essence, supplemental moisture is needed whenever there has been a dry period without rainfall or snow melt sufficient to keep the compost pile moist. In controlling moisture, the goal is to have the interior of the pile damp but not drenched. A different, non-beneficial process occurs when organic materials remain water-logged. In scientific terms, the difference is the distinction between aerobic and anaerobic processes. Aerobic: good; anaerobic: bad. Composting organisms require some moisture because hydration is necessary for health and digestion, but too much moisture results in drowning. When beneficial organisms are drowned in a compost pile, they are replaced by other non-beneficial organisms whose by-products are not desirable (i.e., a smelly, slimy mess). On the other hand, without moisture, the composting organisms die of dehydration. Controlling the moisture in a compost pile can also be viewed as a question of getting air to the composting organisms: in Gunnison where the air is thinner, it is easier to drown or dehydrate them. Heat: In order to thrive, composting organisms need heat. There are two sources of heat for composting: (1) the sun and (2) heat generated by the composting organisms themselves metabolically. In Gunnison Country, maintaining heat is the primary challenge for small- scale composting. The combination of short summers, high altitude, frequent frosts and freezes, and aridity serves to drain heat from Gunnison Country compost piles. A healthy compost pile will generate some of its own heat, but some steps must be taken to preserve that heat in Gunnison’s climate, especially in a new pile. Excessive low or high temperatures adversely affect beneficial composting organisms. The optimum temperature at the core of a compost pile is around 145F, although there is a range of temperatures on either side of 145F at which the composting process will occur. Basically, a cooler pile will simply take longer to compost the raw ingredients. The metabolic activity of composting organisms slows or ceases when temperatures are low. A much hotter pile will “burn” up the materials into ash-like products. In fact, compost piles can get so hot that they actually catch fire. This does happen in places like Arizona and Texas, but it would be very unlikely that a Gunnison Country compost pile would ignite. In Gunnison County, the more heat in the pile the better, because heat losses are a much bigger problem than excessive heat. Gunnison compost piles usually operate with core temperatures lower than 145F. While it is not necessary for successful composting, knowledge of the core pile temperature is handy because it can reveal something about the health of the pile. A sudden drop in temperature can signal problems with the interior composting conditions. In Gunnison Country, core temperature drops in mid Summer indicate a problem which needs addressing. A drop in late Fall is normal. Conversely, a rise in temperature in Spring indicates that the composting process is “heating up” for the season. A rise in temperature in a new compost pile indicates that the composting organisms have begun to work. Garden centers sell special thermometers which can stand up to the strain of thrusting into compost piles – do not use regular thermometers for this purpose. 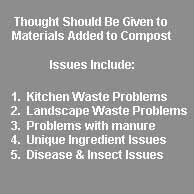 Issues with Kitchen Waste: Some common sense is required. Since some domestic and most foreign mega-corporation farming operations dip or spray fruits and vegetables with insecticides and chemicals preservatives, all grocery store fruits and vegetables should be thoroughly washed immediately before use, including those which will be peeled or processed before eating. The same is true for material which is destined for composting. Apple peels, for example, are great for composting, but the apple should be washed before peeling. [Note that the seeds of some fruits contain toxins (to prevent them from being eaten by animals) and should be avoided, an example being apple seeds. Likewise, the pits of some fruits can be so hard that they are difficult to compost, an example being peach pits.] Citrus peels contain chemicals which inhibit certain beneficial microbes – compost them in small quantities. Leftovers are a good source of compostable material. However, foods which have been heavily salted or which contain large amounts of cooking oils do not compost readily. Moreover, such materials would add salt and other undesirable materials to the compost produced. As an example, we do not follow recipe instructions to add salt and/or olive oil when boiling pastas. Since we almost always end up with a little leftover pasta which we will compost, we wait to add salt until the pasta is plated. The olive oil is intended to prevent the pasta from sticking to itself during the cooking, this may be omitted by simply stirring the pasta in the pot a little more often. A second bonus to our procedure is that pasta water without salt or oil, once cooled, can be used in the garden or on houseplants, which benefit from the starchy water. This technique also recycles the water for a second use. Issues with Landscape and Garden Materials: Material such as wood chips, shredded bark, and branches can be composted, but these take a very long time to decompose – years in Gunnison Country. 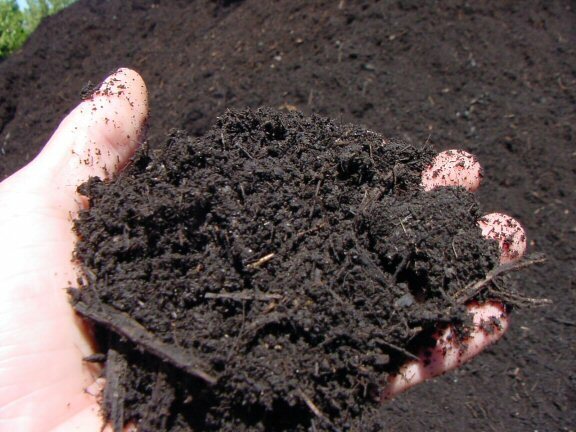 As an additive to a small scale compost operation, these materials will “rob” nitrogen from other compost material, which can degrade the overall quality of the resulting compost. In this case, the problem is controlled by limiting the amount of this type of material in the compost pile. A chipper/shredder is helpful in grinding these woody materials down to a size which composts more readily. Another strategy is to mix manures into wood and bark chips; manure provides the microbes and nitrogen to speed up wood decomposition. Conversely, when adding significant amounts of raw manures to a compost pile it is useful to mix in woody material; this being a case where wood chips, shredded bark, and straw are particularly helpful by “breaking up” the dense manure material. This is also a time when shredded paper (e.g., strips from a document shredder) can be helpful. Note that some manures contain very high amounts of nitrates and ammonia. These manures are considered to be “hot” because they can burn plants if applied “fresh from the field” to a garden or landscape. Composting manures with other materials reduces the risk that plants will be burned. Another, hidden danger with landscape and garden materials is the presence of compounds such as pesticides and herbicides. Think twice before composting plants, lawns, or landscape materials from areas which have been treated with herbicides or other pesticides within the previous year. Pesticide compounds can remain present on the surface of or in the tissues of plants and be carried into a compost pile in the form of lawn clippings, autumn leaves, perennial trimmings, and so forth. A common example is the herbicide 2,4-D, which is the broadleaf weed killer contained in most of the consumer weed-and-feed type lawn care products. Unlike some other herbicides, 2,4-D can persist in the soil and in plant tissues by uptake through the root system, even if the plant itself was not sprayed. Compost made from materials containing significant amounts of this herbicide could be a disaster in a garden or perennial bed. While 2,4-D and other weed killers can be very useful when used wisely, pesticide residues do not belong in compost. Issues with Manures: Being mostly rural, ranching country, Gunnison County is replete with opportunities to obtain manures for composting. These materials are often free for the taking (with the rancher’s prior permission). One thing to be aware of is that some farms and ranches treat their livestock with medicines and other chemicals to prevent diseases and promote growth. Manures from treated livestock can contain trace residue of these substances; so, if this is of concern, ask the rancher or farmer about these issues. Often, it is sufficient to harvest manure from pastures or pens grazed after a certain amount of time has passed after the inoculations, feed supplements, etc. Gunnison County’s Extension Office is very knowledgeable about such issues, especially as in regard to cattle. See, CMG Garden Notes #242 . Most commercially available “fertilizers” (in the bags at the garden center) are basically manures which come from large cattle feed and dairy lot operations. Typically, such manures contain high concentrations of salt, nitrates, and other substances used by lot operators in feeds and supplements. This is the source of the white blush often seen when first opening one of these bags of manure-based products. Besides the fact that such manures are expensive in quantity, they add unwanted materials to small-scale composting and ,therefore, should be avoided. Big city dwellers without ready access to farms and ranches may have no other choice, but Gunnison composters have an advantage here. Note that many garden centers are beginning to stock products based on other materials (e.g., mushroom-based amendments) which avoid some of the problems of commercial manure-based products. Whatever the source of manures, it is best to compost them for at least four months before use in the garden or landscape. In Colorado, this means harvesting the manure in spring or early summer, composting it until late Fall, and then applying the compost. Note that manures do typically have an odor, at least until the composting process is well under way. This can be reduced by encapsulating the manure in the center of the compost pile. Issues Unique to Certain Materials: Some plants generate a natural form of herbicide which inhibits the growth of other plants which might compete with them. These are known as allelopathic plants. Composting great amounts of material from these allelopathic plants can be counterproductive. Examples found in Gunnison Country include some members of the brassica family (e.g., cabbage), kochia weed, and knapweed. In the field, any plant is likely allelopathic when nothing else will grow under or next to it. Composting of material from plants exhibiting allelopathic properties should be avoided. In Gunnison a common example is pine needles, which have some allelopathic traits, so do not add them to compost piles. Some plants contain toxins with are dangerous to humans. Examples include weeds such as cutleaf nightshade and ornamental flowers such as monkshood (Aconitum) and columbine hybrids. Note that animals such as deer can often eat these plants safely, so the fact that an animal eats a plant it does not make it safe for human consumption. These plants should not be included in compost which will be used in a vegetable garden or in areas where livestock graze or children play. The CSU Gunnison Extension Office can provide assistance in identifying which garden and landscape plants contain toxins which render questionable their use in compost. Many books, etc., recommend composting fireplace ashes or spreading ashes over landscape and garden areas. In Gunnison Country, adding ashes to compost may be counterproductive becuse they may raise the pH of finished compost. Since our soils in the Gunnison Country generally tend to be alkaline (high pH) amending soils with an alkaline compost can further raise soil pH. So, when fireplace or barbeque ashes are completely cooled they should be disposed of in the household garbage. For more information on soil pH, see CMG Garden Notes #222. Issues with Heavilly Diseased or Infested Materials: Finally, a compost pile will kill insect eggs, weed seeds, and pathogens if the pile temperature reaches and is maintained at 145F or hotter. Since Gunnison compost piles do not typically reach or maintain this temperature, weeds which have gone to seed or plants which are heavily infested with disease or insects should not be composted in Gunnison Country. They should be burned or bagged and disposed of in the landfill. Common examples of material to avoid composting are house- and garden plants infested with aphids or garden flowers which have succumbed to powdery mildew. 1. The More Compost Piles the Better. In Gunnison Country, compost is generally made in some form of bin. Bins can be constructed from scrap building materials (cheaper) or can be made from various kits sold by hardware and garden suppliers (more expensive). If room permits, a good system is to place three bins side by side. Coarse materials go in one bin until it is full. Then material is added to the second bin until the second bin is full. During this time, the material in the first bin has begun composting. When the second bin has been filled, start filling the third bin. By the time the third bin is filled, the compost in the first bin should be ready to harvest, and coarse materials may be added to the first bin. On a rotational basis, each of the bins will have composting material in a different stage of development. If there is only room for one or two bins, turn the piles a little more frequently and sift out finished compost as often as possible to make room for more material. In Gunnison Country, the revolving plastic drums often sold on television for composting are usually unable to generate compost quickly enough, or in sufficient quantity to justify the expense. If one wishes to try drum composting, obtain a food grade drum from a commercial food manufacturer (they often have damaged empties available for small cost). Look for drums which have lids which can be opened entirely, as opposed to drums which have only 3 or 4 inch spouts. These drums can be laid directly on the ground sideways and rolled back and forth to turn the contents. Fully opening lids allow easy access to the contents for adding material and removing compost and for evaluating the progress of the decomposition. Consider the problem of how air will be getting to the contents. Dark colored drums collect heat better and therefore speed up the composting activity. In general, composting drums require less added moisture than other types of compost bins. 2. Keep up the Biomass. To achieve useful core temperatures in a compost pile in Gunnison Country, the amount of organic material must fill a space about 4x4x4 feet. Bigger is better. A pile with less material will have a hard time generating and holding enough heat to maintain the composting process efficiently. Many composters place a perforated plastic pipe upright in the center of large compost piles. This helps get air down into the pile and is a handy place to add water when a pile starts to dry out. Some garden centers sell large augers which bore holes into compost piles to open paths for air and moisture. Several areas around Gunnison Country have frequent winds. Sometimes these winds are strong enough to blow compost materials right out of the pile. Fertile ideas for preventing this include: constructing compost bins from materials such as unmortared concrete blocks, wrapping wire or wood bins with old plastic tarps (which also helps hold heat inside), and siting composting activities in areas protected from prevailing winds. In any event, it makes sense all things being equal to construct bins so that any door or access hatch opening does not face the normal winds. For similar reasons, it is best to site compost piles in well-drained locations. While moisture is necessary for composting, excess water can float away composted material. Moreover, areas where water collects are the lowest areas and therefore collect colder air, inhibiting the composting process. If one thinks a little about suitable places for compost piles, the ideas will come flooding in. Do not worry if there is a lot of material to compost. It is not usually possible for a small-scale operation to generate too much compost for the composter’s garden and landscape. It excess compost is made, offer it to friends or neighbors. Knowledgeable persons will usually jump at the chance to take it. The amount of compost to use in home gardens and landscapes has been analyzed by CSU’s Extension Service and information is available on line or at the local Gunnison County Extension Office. 3. Utilize a Variety of Organic Materials. For a small-scale composter, it is important to incorporate various types of organic materials in each compost bin. Some authoritative books even give formulas for the ratios of various materials to be added to a compost pile. 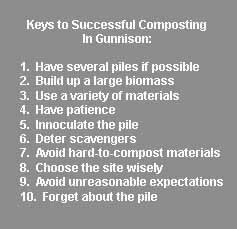 While this may be scientifically sound advice, the attempt to adhere to rigid rules for building a compost pile in Gunnison is much less important than simply getting started with a variety of materials and building up the biomass large enough to start up and sustain the composting process. (Note that the material in a healthy compost pile will naturally shrink in size as the decomposition process occurs, thus making room for more material to be added.) Using of a variety of materials has several benefits: a) different textures of material help to establish and preserve air flow in the pile, b) the variety helps to ensure that a diverse amount of trace nutrients and minerals are in the finished compost, and c) the variety creates a synergistic process in decomposition where one type of material complements the others in the pile. 4. Have Patience. Because Gunnison Country is arid and cold, compost piles do not process material at the same pace as compost piles in warm and moist climates. Books and TV programs which talk about having finished compost from start to finished within a few weeks or months are not talking about Gunnison Country. Compost bins in Gunnison usually require a year or so to generate finished compost. In a Gunnison winter, the process of composting will slow way down because the deep cold will send many of the micro-organisms into a hibernation. One tip for prolonging the vigorous action in the compost pile is to cover it with black plastic or landscape cloth. The black covering will absorb solar radiation and keep the pile going longer in Fall and start sooner in Spring. Hold down the plastic/fabric with weights or skewers to prevent it from blowing away. Try to do this in a way which is easy to remove when adding new material to the pile. If using plastic rather than fabric, punch several holes in the plastic for air flow. One good key to when compost is ready is the smell, it should smell like good farm soil. If it smells like the original constituents, or had an ammonia or sour smell, the compost needs more time. Another key is appearance, the compost should have turned into loose, dark material which resembles rich loam. It should be loose and crumbly. Since the outer portions of the pile will decompose at a slower rate than the center and bottom portions, pull the outside portions aside and remove the finished compost inside. A homemade screen made from 2×4 inch lumber scraps and hardware cloth is handy for separating the finished compost from the unfinished material. 5. Innoculate the Pile. Although the micro-organisms necessary for composting are present everywhere in the air and the soil, in Gunnison Country it is helpful to innoculate a compost pile with additional “little soldiers.” There are numerous sources of these wee beasties: cow or poultry manure, finished compost itself, commercial compost starters (which contain helpful bacteria, usually in a powdered form), and garden soil from an established garden. (In fact, it is useful to add a few shovelfuls of soil into the compost pile anyway.) Spread the innoculant around the pile and mix it in. In a sense this is like planting little composting seeds in the compost pile. This would be a good time to add water if the pile is at all dry. Inoculation can occur when the pile is started, whenever the pile seems like it could use a jump start, or both. 6. Protect the Bins from Scavengers. Because Gunnison is rural, there is no part of the County where wildlife is not prolific. Some thought should be given to protecting the compost piles from attracting wildlife. Rabbits and racoons, for example, can find kitchen scraps a temptation. One simple way to deter these uninvited guests is to line compost bins with hardware cloth (wire screening) Deer, elk, and bear are more interested in trash cans, dumpsters, and bird feeders than in compost piles. The last bear at the authors’ Ranch walked right past the compost bins and headed for the dumpster. 7. Avoid Hard-to-Compost Materials. Kitchen scraps such as meats and dairy products are not recommended in Gunnison compost piles. Such things attract vermin and predators. Likewise, manures from pets are not advisable because the cooler operating temperatures of Gunnison compost piles are not high enough to kill off the pathogens common in such substances. Additionally, use of horse manure or hay in compost piles is inadvisable because the core temperatures in Gunnison compost piles are not hot enough to destroy the seeds usually present. Untreated pet and human hair can be composted, but moderation is necessary because these materials can form mats which repel water and interrupt the composting process. The same matting problem applies to paper, which can be composted but should be used in moderation. Usually it is better to recycle paper at the County recycle center. Autumn leaves are good for composting but they also can form layers which repel water (it helps to crush the leaves before adding them to compost piles). A mix of materials with different textures can help to avoid the matting problem. Straw can be added to compost piles, but straw can also form mats and takes a surprising amount of time to decompose. Straw is beneficial, however, in small amounts to help maintain air flow in a pile or to help dry out a pile that has become too soggy. Tree and shrub trimmings can be composted, but these woody materials require a significantly longer time to decompose fully. A chipper/shredder can speed up the process of composting woody materials. 8. Place the Compost Pile in a Beneficial Location. Avoid the temptation to hide the compost pile behind a screen or under a lot of shade. The more daily sunshine the better. Locate compost piles where they are protected from cold winds. Also, pick a location which is well-drained but close to a source of water. Often, this means putting compost piles adjacent to a vegetable or flower garden, which makes it easy to moisten a dry pile with the garden hose when watering the garden. Put the pile near to the house to reduce the hike through the snow to deposit materials (kitchen scraps) in Winter. A healthy compost pile does not have noticeable offensive odors, so the fear of smells should not dictate the siting of the pile, unless a great deal of raw manure is to be used in the pile. 9. Avoid Unreasonable Expectations. The composting process is a continuous one. Totally finished compost is dark and crumbly. It looks and smells like rich loam. However, partially finished compost is still useable. A few undecomposed twigs or leaves do not harm anything and compost at this stage can even be beneficial for working into heavy soil to “break it up” into better soil. Do not expect compost to solve a serious soil deficiency. Such a deficiency – identified by proper soil testing – is best dealt with by a specific commercial product designed to address an serious soil problem. As a hypothetical example, a significant need for extra iron in a particular garden should be dealt with by application of a product designed to supply iron (e.g., an iron chelate), which should be used at rates determined by a soil test. Compost alone will not be able to supply enough iron to cure a true iron deficiency. (Incidentally, a lack of iron is not usually a problem of soils in Gunnison Country; what appears to be iron chlorosis is more often a watering problem.) Similarly, compost will not cure a soil with a serious pathological problem. However, over time compost will help to create a healthy soil which will help grow plants which are resistant to various diseases, insects, etc. Ordinarily, compost from a healthy compost pile will provide most of the nutrients and elements necessary to fully satisfy the needs of garden and landscape plants. However, in Gunnison, additional nitrogen is usually needed to supplement the compost. Plant-useable nitrogen is relatively inexpensive and easy to apply. In a garden or landscape where compost is used, this often is the only fertilizer required, unless a specific plant has a special need. 10. Forget the Compost. As mentioned before, composting takes a little longer in Gunnison Country that elsewhere. It is possible to kill a compost pile with kindness. Over watering or excessive turning can be counterproductive. A healthy compost pile should sit happily by itself, cooking away, and making wonderful material for garden and landscape. The natural rhythm for composting in Gunnison Country is to build up the materials in the pile in Spring (starting with the material that accumulated during the previous Winter), monitoring the pile during the Summer, and harvesting the finished compost in Fall. Harvested compost should be spread over the areas where wanted, worked in a little if possible, and left there undisturbed over Winter until ground preparation commences the next Spring. Buying Plants? Consider Your “Zone”…. Often we hear that, for gardening and buying outdoor plants, Gunnison County is in “Zone 4” or something of the sort. This statement can be very confusing, even to experienced gardeners because there are several different organizations which have promulgated Zone maps or lists attempting to define the climate and growing conditions in each area of the United States. They usually use their own unique guidelines and definitions of what a “Zone” is. These organizations do not generally reconcile their maps and listings with one another. The idea is that a person buying a plant, whether nursery grown or seeds, can match the plant’s hardiness rating with the zone in which it will be planted. One of the popular zone maps is promulgated by the USDA. The USDA attempts to describe different areas in Colorado according to the hardiness which a plant must have to survive in each area. In this case, the Hardiness Zones are designed to show the average annual minimum temperature experienced in a given area. Under this system, Gunnison County is mostly designated as a “Zone 4.” Thus a gardener would know that a plant must have a Hardiness rating for Zone 4 in order to survive in Gunnison. The problem is, as bitter and sometimes expensive experience has demonstrated, many plants rated for Zone 4 die an awful death – alone, cold, and hungry – when planted in Gunnison County. My personal experience is that Gunnison is better considered as a Zone 2, unless one knows ahead of time that a particular plant rated for Zone 4 will do well here. Even saying “Gunnison County” is overly-broad. There are significant differences in the plants that can survive as between Gunnison, Crested Butte, Tincup, Powderhorn, Pitkin, etc. In fact, there are significant differences between Crested Butte South, Crested Butte proper, and Mt. Crested Butte. In Gunnison itself, there are places around town where some plants do well and other locations where the same plants cannot survive or do very poorly. On top of all this, every landscape contains microclimates. I have several plants which will only grow in one particular part of my yard where a favorable microclimate lets me “cheat” and have a plant which would not normally do well in our area. So what is a person to do with all of this confusing and sometimes contradictory advice? The best answer is to use plants which have proven to be survivors in your particular part of Gunnison County. Ask knowledgeable local gardeners for tips. Deal with a nurseryman or seed supplier who actually knows what works in Gunnison County. On the “High Altitude Gardening Information” page of this website, you’ll find an extensive list of plants which have been successful in one or more parts of Gunnison County. This is an excellent starting place. Every spring we get ready to renew our ongoing battle with that weed, that that yellow flowered pest, that nemesis of our lawns, the Dandelion. The common dandelion (Taraxacum officinale) seems to grow almost anywhere. It prefers moist sites like our lawns, pastures and meadows. Every year at the first sighting of that little yellow flower, we rush off to buy tools, chemicals and the latest gadgets to get rid of that water-consuming, nutrient-sucking weed. We dig, we pop, we spray and yet, come next spring there they are again. So off we go again to what has become our annual ritual. There has to be a better way. Well there is. The first thing we need to come to grips with is what Montana State University said in one of their articles: “Weeds are very good at what they do.” Dandelions, like other weeds are opportunists. They take advantage of conditions that favor their growth. These conditions, when it comes to our lawns, include bare patches and stressed-out turf caused by poor watering, incorrect mowing habits, and improper fertilizing regiments. The best defense against dandelions and other weeds in our lawns is to grow a thick and healthy turf. Dandelions (From the Old French, “Tooth of the Lion”) are perennial weeds, not annuals. What this means is if we don’t get the root, we will be revisited by our little friend next spring. If we choose to dig them out, it is best done when they are in early growth and the root has not gotten long. It is important to get all of the root if possible, or at least 4” to 6” inches. If we get enough of the root system, even if there is a little left, the plant may not have enough energy to reestablish itself. If we choose to go the herbicide route, it is important to understand the biology of weeds. Dandelions’ survival skills are such that they use all of their stored energy from last season to push out this season’s new growth. In other words, the plant’s energy is going upward to produce leaves, flowers, and seeds and not much is going down into the root system. This may explain why we think we kill the dandelion when we use chemicals in the spring, only to find out that they are back the next spring. Frustrating? What then are we to do? The solution is to apply our herbicides in the fall. Why? It goes back to weed biology again. In the spring all the energy is going up and in the fall where is the energy going? That’s right, down. The plant is getting ready for the winter and in doing so, it begins to store carbohydrates and starches in the roots. This is the best time to use your herbicide. When applied in the fall, the herbicide moves more easily through the plant and especially into the roots. In Gunnison County, this time is from the very last of September to the first two weeks of October. I have had good results using this technique. Give it a try. Avoid using de-icing salts near lawns, vegetable gardens and flower beds. Salts can accumulate and damage plant roots and can also be corrosive to concrete, brick and stone surfaces. Consider using sand, cat litter, sawdust or other non-chemical products when possible. If using de-icing salts can’t be avoided, remember that in very cold weather, ice melting salts are ineffective. The two most commonly used and inexpensive materials used for ice melting are sodium chloride (NaCl) and calcium chloride (CaCl). NaCl will melt ice until temperatures drop below approximately 15F and CaCl will be effective to approximately 5F. Urea (nitrogen), potassium chloride, magnesium chloride, and calcium magnesium acetate are also used as ice melting products, but these become ineffective at temperatures below approximately 15-20F. Because plants need small amounts of magnesium and calcium, using small amounts of ice-melting products made with these chemicals will not be as harmful as using sodium-chloride based products. In order to avoid injuring plants, the Parks Maintenance Division of the U.S. Department of Interior considers the maximum safe application of ice melting salts to be one-half pound of salt per square yard per winter. When gardening during the warmer months, think ahead to the winter. To prevent salt damage, avoid planting in areas that will need to be heavily salted during the winter months. Plan where snow will be piled in order to avoid piling snow that may have salts in it on your lawn or planting areas. Be aware of where salt-laden runoff water may go on your property and take steps to prevent runoff from affecting planted areas or waterways on you property. Over application of ice melting products can have potential negative impacts on surface and ground water – use them wisely and sparingly. In order to reduce the amount of de-icing salts used, remove snow before applying ice melting products and only use de-icing products on remaining patches of ice. If salt damage to plants has occurred, it will become evident in the spring and summer as browning of foliage, stunting of growth and die-back occurs. If you suspect salt damage, have a soil test done. Soil tests may indicate how to correct soils with high salt content – flushing with water or adding a small amount of gypsum to soil may aid in reducing salt levels. Ice melting products are best applied prior to ice formation. These products work by attracting moisture and forming a chemical solution with water that initiates melting. So, applying before or during a snow event initiates the formation of the solution that will prevent ice formation. Federal Highway Administration research has shown that if temperatures are near the threshold where salts become ineffective at melting ice, it can be helpful to add water to ice-melting products (at a ratio of 30% salts and 70% water) to create a liquid solution before applying. Unless you had insect or disease problems, leave perennials and ornamental grasses uncut until spring in order to capture winter snow and act as an insulating blanket. The remaining seeds and fruits will be a good winter food source for birds and other wildlife that remain in the Gunnison Valley during the winter months. Herbaceous perennial beds should be covered with 2-3” of bark mulch or pine needles for winter protection. Gunnison Gold compost would be a great mulch/topdressing for perennial beds for protecting perennials during the winter. Mulch will help the soil to retain moisture and maintain a more even soil temperature during freeze-thaw cycles. Gravel mulch can be useful in Xeriscape flower beds where there is not as much of a need for the moisture retention offered by organic mulches. Gravel mulches or pebbles can absorb heat during sunny winter days and keep roots warmer than they would be otherwise. For vegetable gardens, it’s best to remove plant debris from last growing season. Pests and diseases are likely to over-winter in vegetable gardens. If you’ve had insect or disease problems in your vegetable garden, a late fall or early winter tilling or turning of the soil in vegetable garden beds can help control insects because it exposes over-wintering insects to winter conditions. Make sure that plants receive a deep watering in the fall before temperatures begin to drop and the soil begins to freeze. Roots do not go into dormancy as quickly as above-ground parts of plants, so having moisture available to roots during winter is important. Also, moist soils hold more heat than dry soils, so frost penetration will be deeper and soil temperatures colder in soil that has been allowed to dry out. Winter food shortages can force rodents and other small animals to feed on bark, roots, twigs, flower buds and foliage of garden plants. Small trees can be protected from rodents and other small animals that might eat the bark at their bases by placing a cylinder of ¼” wire mesh or plastic tree guards around the trunk to a height of 24” above the anticipated snow line. Rodent repellants that render the taste and smell of plants undesirable are commercially available. Deer often seek out garden plants as food sources in the winter. Choosing plants that are unpalatable to deer will prevent deer damage in the garden. Planting more susceptible plant species near the home, where deer are less likely to venture, may prevent some deer browsing damage. Netting or fencing garden beds, small trees and shrubs may help to discourage deer browsing. Commercially available deer repellants that can be sprayed on or around plants may be somewhat effective in reducing browsing. A homemade spray of 20% whole eggs and 80% water has been found to be an effective deer repellant if reapplied every 30 days. Aspen trees (and other smooth & thin bark trees in our area, such as ash and maple) are extremely prone to frost cracking and sunscald in the spring and fall as freezing nighttime temperatures and intense sun during daylight hours cause burning, expansion and contraction of tissues, especially on the south and west sides of trunks. Consider wrapping the trunks of younger thin & smooth barked trees with tree wrap to protect them from frost cracking and sunscald. Tree wrap will reflect the sun and keep the bark at a more constant temperature. Tree wrap should be removed in the late spring, as tree wrap left on during the growing season will trap moisture and provide habitat for insect pests and disease pathogens. Avoid pruning of woody plants until next growing season if possible – internal tissues exposed by pruning cuts may be damaged by extremely low temperatures. If it is necessary to prune broken branches during the fall or winter, leave a stub a few inches long, which can be pruned back to the branch collar in the spring. Consider staking newly planted trees that might be susceptible to damage from wind and snow loads this winter. 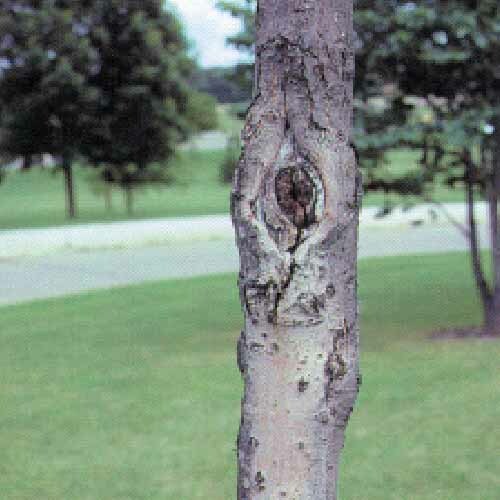 Be sure to use staking material that will not damage the bark of trees by rubbing during windy days. Newly planted marginally hardy trees and shrubs can be protected from intense sun and drying winds during their first couple of winters by wrapping or screening them with burlap. Until established, pine trees and other evergreens are especially susceptible to winter desiccation on windy and sunny winter days, as more moisture is lost through their needles than is absorbed by the roots. Browning or bleached needles, often on the south or windward side of a tree may indicate that desiccation is occurring. As temperatures begin to warm and the ground begins to thaw in the spring (or if we get any warm spells when the temperature exceeds 40 degrees and the ground begins to thaw during the winter) monitor the water needs of the plants in your garden. If possible, don’t wait until the irrigation ditches are turned back on to give trees and shrubs a deep watering – they will likely be drought-stressed after a long, dry winter. Shrubs and trees that are likely to be damaged by heavy snow loads can be protected by wrapping them with flexible twine or bicycle tire inner tubes. The bundled branches of trees and shrubs will help support one another. Branches of trees and shrubs that have been badly bent by snow and ice can sometimes be straightened by staking or tying (with a non-chafing material like flexible twine or bicycle tire inner tubes) into place during the next growing season. Stakes and twine should be removed as soon as the stem or branch remains upright on its own again. Shaking or knocking snow and ice from branches can damage trees and shrubs. Rather than trying to remove snow and ice, it is best just to let snow and ice melt from the plant. If you’re concerned about branch breakage, newly fallen snow may be gently swept from drooping boughs, using gentle upward strokes to loosen the snow. As temperatures drop, be sure to remove any garden chemicals that might freeze from sheds and move them to areas where their storage temperature will not fall below 40F. Frozen liquids could expand enough to break containers, and may spread concentrated chemicals within reach of children or pets. Winterize faucets, sprinklers, and hoses. Underground sprinkler systems should be blown out with an air compressor in fall, hoses should be completely emptied of water and outdoor faucets should be drained or insulated with Styrofoam covers to prevent freezing pipes. Plants need less water when going into the dormant season. Excess water in the fall stimulates new growth which will not be hardened off properly for the winter and will be more susceptible to winter kill. Soak your plants deeply when you do water, but don’t water as often. Give all turf, trees and perennial beds a deep watering before the ground freezes. Use a soil probe or trowel to dig down into the soil in order determine plants’ water needs. Fall is a great time to build a compost bin if you don’t already have one. Simple compost bins can be constructed very inexpensively. Add leaves and non-diseased plant material (except weeds that have gone to seed) removed from flower beds to your compost pile. In addition to creating a wonderful organic top dressing for your flower beds, the composting process kills many of the fungi and insects that might otherwise over-winter on plant material. Interesting dried seed heads, flowers and stems cut from perennial beds can be used to make beautiful outdoor arrangements. Collect pine cones, dried seed heads and other things used to make holiday ornaments before they’re covered by snow. If you haven’t had a soil test performed on your property, consider doing it this fall. The results will help to determine the best course of action for fertilizing as you begin to plan for next season. Do-it-yourself soil test kits can be purchased at garden centers, or the Extension Office can send soil samples to a lab for testing. Prepare your irrigation system for winter (including hoses!) by expelling all water from the system. This winter, plan to avoid using de-icing salts near lawns, vegetable gardens and flower beds. Salts can accumulate and damage plant roots. Consider using sand or sawdust. If using de-icing salts is necessary, magnesium chloride-based products tend to be less harmful to plants than other de-icing salts. Fall is a great time to do a thorough weeding in your garden to prevent annual weeds from going to seed and perennial weeds from over-wintering. Fall is a great time to core aerate the lawn. It will relieve compaction, allow more oxygen to reach the root zone of the lawn, help reduce fungal problems and improve the overall health of turf. Consider using an organic top dressing (such as Gunnison Gold compost) on the lawn after aerating, working it into the holes created by aerating. Fall is a good time to renovate and re-seed the lawn. Eliminate weeds, amend the soil and plant grass seed in areas that need renovation. Water seeded areas thoroughly after planting and keep moist as long as the ground isn’t frozen. Rake leaves from lawn areas. Leaves left on lawn will mat and prevent oxygen and moisture from reaching grass. Use leaves as brown material on your compost pile. Turf areas should receive a late season fertilization with a quick release nitrogen fertilizer, such as ammonium sulfate. Even though top growth has slowed, the roots of cool season turf grasses are still quite active in Autumn. Fall fertilization will help lawns green up more quickly next spring without the rapid flush of new growth that often happens after early season fertilization. Soils in our area naturally tend to have high levels of phosphorous and potassium, so addition of fertilizers with these elements is often not necessary. Herbaceous perennials can be cut back, given a deep watering and covered with 2-3” of bark mulch or pine needles for winter protection. Gunnison Gold compost would also be a great winter topdressing for perennial beds. Mulch will help the soil to retain moisture and maintain a more even soil temperature during freeze-thaw cycles. Leaving (non-diseased or insect-infested) dried plant material in flower beds can be good for winter interest and protection. Remaining dried foliage and stems acts as a sort of “snow fence” by capturing and storing snow that will keep the ground moist during periods of snow melt. Work screened compost gently into the soil in flower beds, if possible to a depth of at least 2”. Be careful not to damage the roots of perennials. In a cold climate like ours, late fall is too late to divide perennials. Plants should be given enough time to get established before the ground freezes after dividing. Wait until spring when plants begin active growth or late summer as growth slows to divide perennials. If planting bulbs in the late fall, plant a bit more deeply than usually recommended to give bulbs more time to get established before the ground freezes to the depth at which they’re planted. Fall is a good time to plant wildflower seeds. Seeds planted in the fall will undergo the necessary stratification during cold winter temperatures and will emerge from dormancy as melting spring snow gives way to warmer temperatures. Collect seeds from your garden to store for next year or to share with friends. Dry seeds thoroughly and store them in breathable envelopes in your refrigerator. Aspen trees (and other smooth & thin barked trees in our area, such as ash and maple) are extremely prone to frost cracking in the spring and fall as freezing nighttime temperatures and warm daytime temperatures cause expansion and contraction of tissues, especially on the south and west sides of trunks. Consider wrapping the trunks of younger thin & smooth barked trees with tree wrap to protect them from frost cracking and sunscald. Tree wrap should be removed in the late spring. Avoid pruning woody plants until next growing season if possible. Internal tissues exposed by pruning cuts may be damaged by low temperatures. If it is necessary to prune broken branches during the fall or winter, leave a stub a few inches long, which can be pruned back to the branch collar in the spring. Newly planted, marginally hardy trees and shrubs can be protected during their first couple of winters by wrapping them in burlap. After harvesting, clean out all dried plant material in vegetable gardens. Insect pests tend to over winter on the leaves of many vegetable plants. Consider planting a cover crop such as annual vetch, clover, or rye in your vegetable garden. Cover crops prevent soil erosion, add organic material to the soil when plowed under in the spring, and those in the legume family add nitrogen to the soil. When bringing houseplants and non-hardy container plants indoors for the winter, be sure to clean soil off of the outside of pots, remove dead foliage, and treat for insects as necessary in order to avoid bringing unwanted pests into your home or greenhouse. Be vigilant for pests on these plants as indoor conditions are often conducive to outbreaks of insects brought in from the outdoors. While plants will usually adjust to indoor conditions, they may be unattractive for a few months. To lessen this response next year, begin to lower the light intensity your plants are receiving outdoors by gradually moving them to a more shady location. 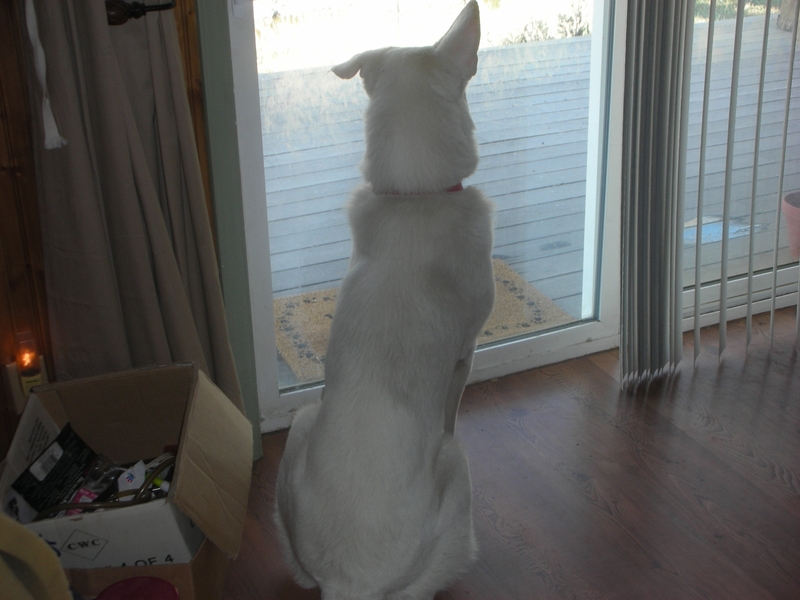 Ideally, you would want to begin this acclimation about one month before you will move them indoors. SDC on Don’t Move Firewood: It Bugs Me! gardeninfoforyou on What Fertilizer Should I Use?